and members of the public for centuries. 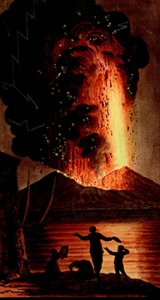 This exhibition in the Weston Library at the Bodleian has eye witness accounts, scientific observations and artwork charting how understanding of volcanoes has changed over the millennia. Some of the most spectacular volcanic activity is in the exhibition: the 79AD eruption of Vesuvius and the 19th Century eruption of Krakatoa and Santorini. The exhibition is on until 21 May, 2017.